2/3 cup unsweetened soy milk. 1 tbsp. white wine vinegar. 1 tsp green food coloring. ½ tsp green food coloring. Sift the flour into a bowl, add the castor sugar, baking powder, bicarbonate of soda, salt and mix well together. Add the lime juice, soy milk, cooking oil, white wine vinegar, vanilla essence and food coloring. Whisk until well combined and there are no lumps. Pour into a round 20cm greased cake tin. Pop into a pre-heated oven and bake at 180 degrees for 30 minutes or until the cake tester comes out clean. Allow cooling for 10 minutes in the cake pan. Then turn out onto a cooling rack and allow to cool completely. Cream the butter until light and fluffy. 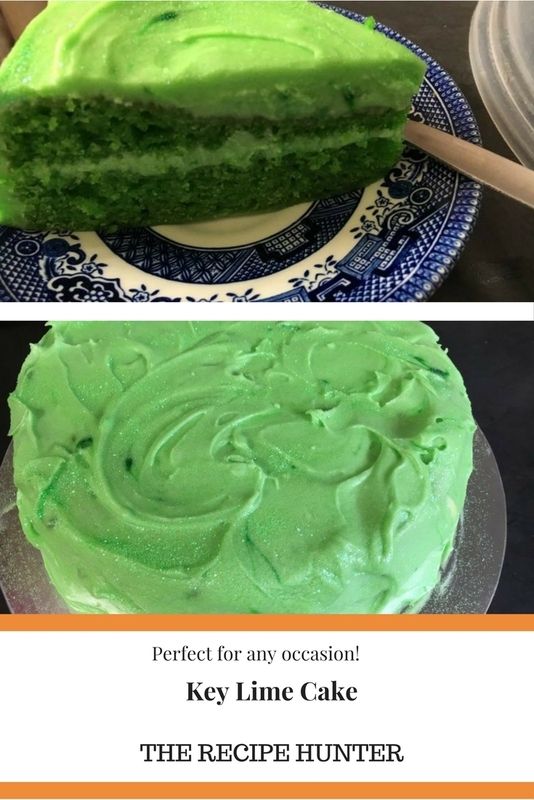 Sift the icing sugar add the green food color and lime juice and whisk till well combined. If you add more icing sugar you will have to add more lemon juice to keep it at a spreading consistency. To assemble the cake, cut the cake in half, place one layer down on your cake board, spread some icing over the top. Place your second layer on top of the icing. Lastly, cover the entire with the leftover icing. Pop into the fridge to set for 30 minutes. I’ll have to try the key lime cake! Thanks for the follow Timothy and thanks for your comment. Please let me know what you think once you made it.